How to create beautiful Hand made gifts? Shower the couple with a gift they’d never buy themselves but will surely appreciate: a customizable 8- by 10-inch print of the city skyline commemorating their big day. Matte and frame are available for an extra charge. Give the jet-setting couple a pair of matching passport holders from Flight001. Made with leather, these holders are available in four colors: lime, blue, orange, and cement. A modern-take on his and hers towels, this monogrammed set from West Elm can accommodate up to nine characters. The 100-percent organic cotton collection, available in white or grey, includes three sizes and a bath sheet. 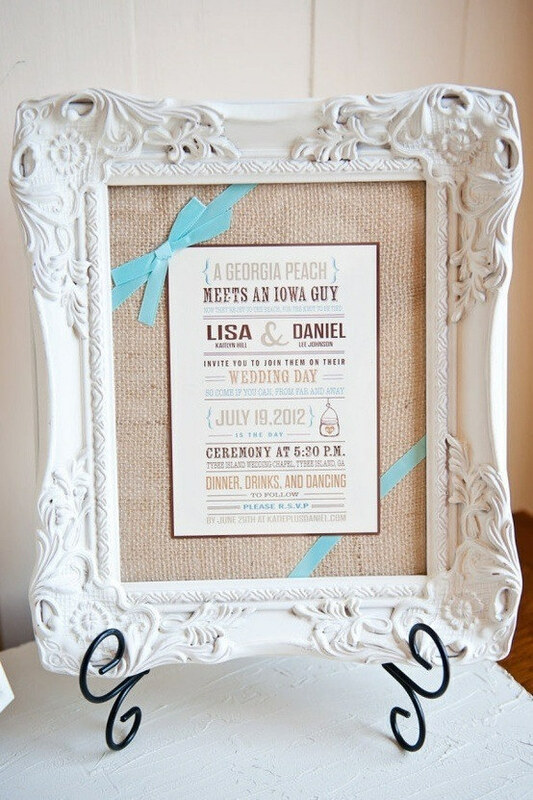 Showcase mementos from the big day in a custom frame. Place an invitation or ceremony program alongside a photo of the bride and groom. Another nostalgic option: Pair a picture of the couple’s first dance with the CD of their wedding song. 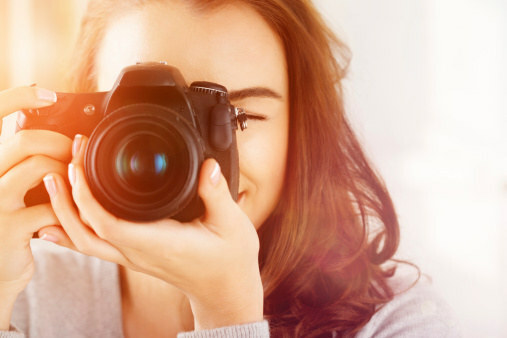 If you didn’t capture the perfect shot on your camera, contact the photographer and ask for a sneak peek. Give the happy couple a glass dome server that will become a mainstay at all their parties. The made-in-the-USA maple wood tray is perfect for housing fruit, cheese, or homemade treats. 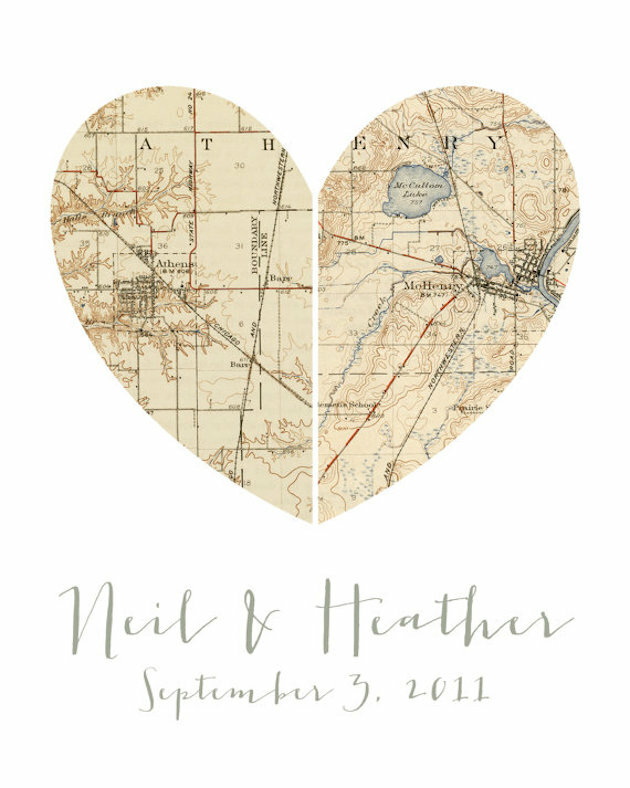 Spotlight the hometowns of the bride and groom with this framed map art. Or, pay homage to the cities where they met and got married. The geography, text, matting, and framing are customizable. Spoil the husband and wife with a fun class they can enjoy together. Sign them up for a cooking class at a culinary school or even a kitchenware store. If cooking isn’t their thing, let them try a hobby they’ve always wanted to learn, like ballroom dancing or sailing. An elegant lambskin journal is the perfect tool for a pair who’s big on preserving memories. Titled “Travels and Experiences,” this notebook will come in handy in far-flung destinations and cozy nooks close to home. A second layer of rosette letters on top of a cherry-red base give this craft extra pretty polish. “It’s a risky gift because you can’t return it but is something that really makes the house nice and we’ll keep forever,” says one bride. Says another: “A friend framed a sketch from a well-known Southern artist, titled ‘June,’ the month we were married.” You can also buy a less expensive print from Etsyand have it framed. Several brides mention this idea: Take the wedding invitation and turn it into home decor. For example, have it framed to hang on the wall, or have an artist (maybe that’s you!) paint delicate flowers or leaves around the border, then frame it. Other options: have it printed on a throw pillow or made into a decoupage plate (try Kaas Glassworks in New York City). “One friend gave us a gift card to a local homebrew store, knowing that my husband and I have been getting into brewing beer at home,” says Emma of Columbus, Ohio. “It’s a beautiful upgrade to our everyday forks and knives, something we wouldn’t necessarily buy for ourselves, and something that we use each and every day,” says Kathleen from New York City. “The Reed and Barton pattern we chose is very simple, yet modern, and has some heft to it, so it can work for more formal gatherings too. Several brides mention how much they loved being able to go on a date night after the wedding―and not spending a dime. 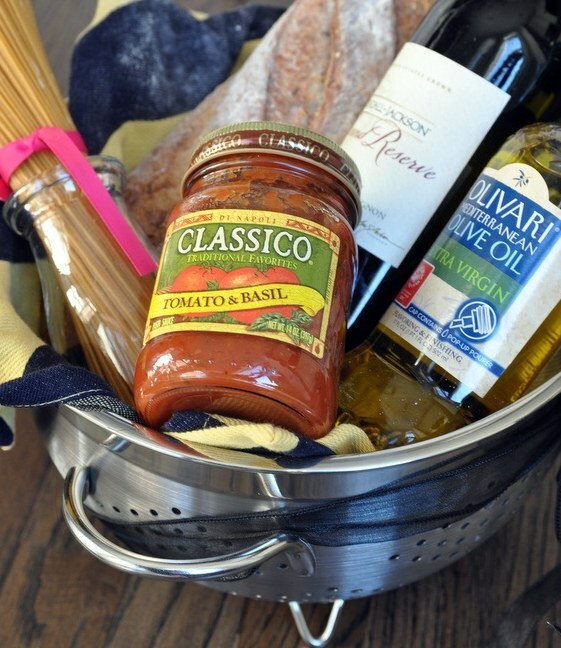 READ Why is personalized gifts so popular among young buyers? And at a time when couples are opting for cash gifts over registries, brides and grooms are offering less and less guidance in the gift department. 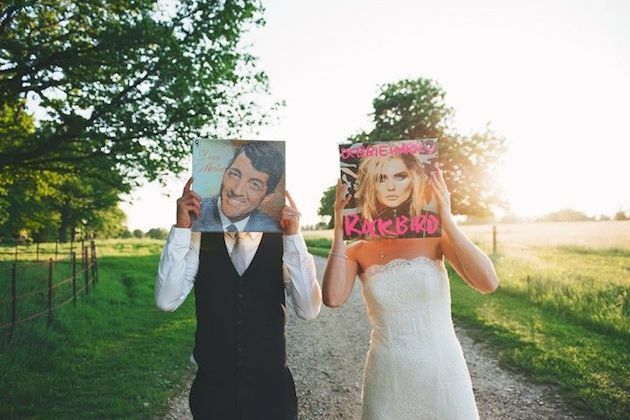 And so, in the first of our wedding season series of posts for the party guests, we’ve been perusing presents, and brought you our pick of ten unique wedding gifts, that every couple will adore. We were a little inspired for this one by Becky and Tyler’s porch seat wedding gift from earlier this week. 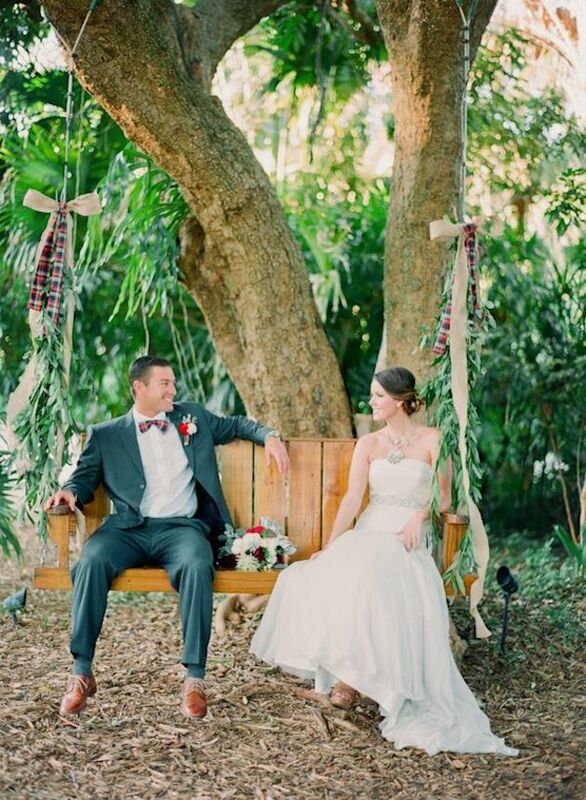 A porch or garden swing with room for two is such a sweet gift to buy a couple for their wedding. Whether you’re creating a budget DIY version, or splashing out with a carpenter crafted swing, this gift is not only romantic, thoughtful and fun, but it will create memories for years to come with a pride of place in the couples’ home. Buying a piece of art for somebody else can be difficult, but if you think you know your couple and their tastes and styles well, then a piece of art is such a heartfelt present that will hang in the happy couple’s home forever. 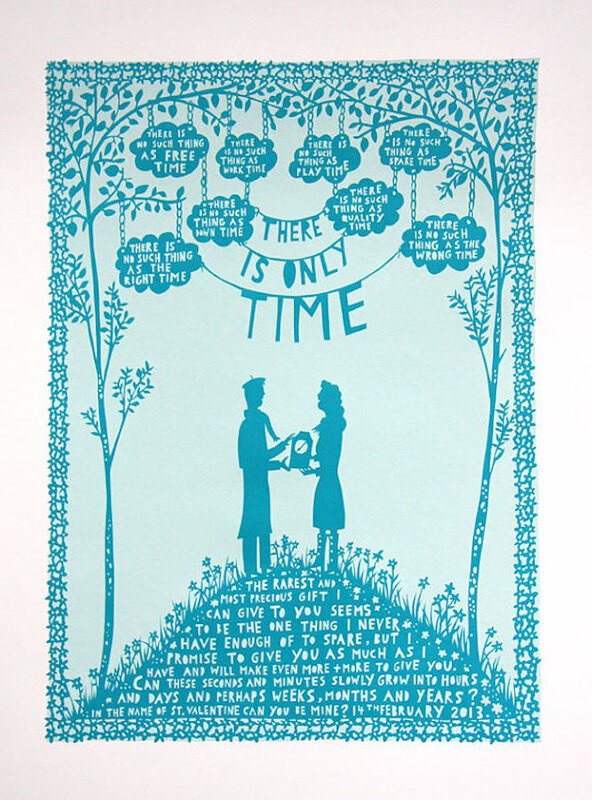 Choose a romantic piece that ties in with the theme of the gift, my personal favourite is Rob Ryan who creates the most whimsical and poetic pieces of laser and screen print art. The couple who plays (records) together, stays together. Okay, we made that one up, but we’re standing by it! 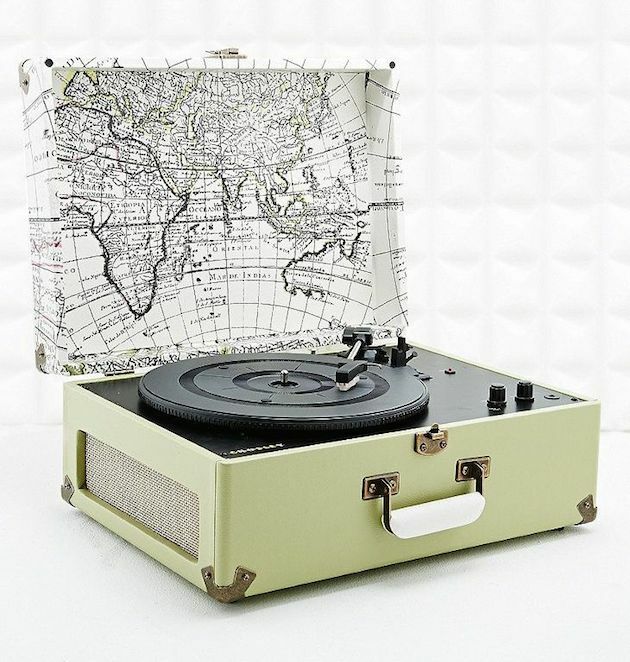 A vinyl player is a fun gift for any music-loving couple embarking on their life together. Start their collection with a few choice records, and let them enjoy a lifetime of lazy days and cool tunes. 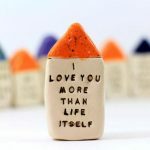 This is a cute little present for someone who plans on giving their couple a cash gift, but wants to add something a little bit personal as well. 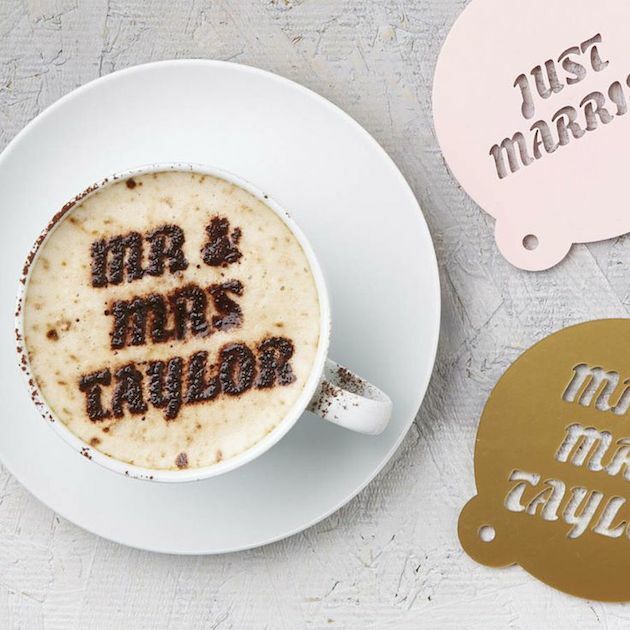 From wine bottles to cake plates, look to websites like Not on the Highstreet and Etsy, for fun gifts that you can customise just for your bride and groom. 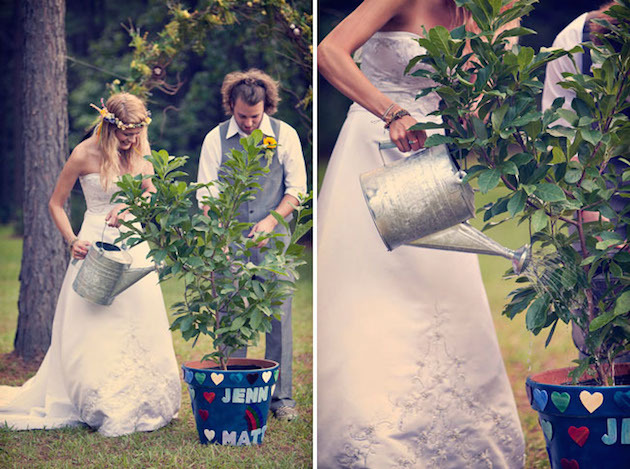 Couples love to give small plants or seeds as wedding favours, so why not reverse the trend and give the bride and groom in your life, a fruit tree for their wedding? Beautifully symbolic, a fruit tree is the gift that keeps on giving – who doesn’t want to pick apples from their garden for their 15th wedding anniversary? I adore the idea of gifting furniture for a wedding. I remember my aunts, and my own parents telling stories about their wedding gifts, and often the treasured presents which stood the test of time were furniture. 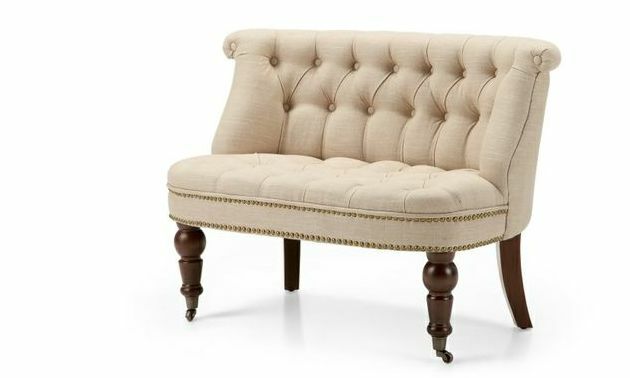 And while it can be difficult to choose a bulky item for some one else’s home, by selecting something like a love seat, with just enough room for two, not only are you giving a gift that will be used and loved for years, but it’s not to big and have heaps of added meaning to it as well. I’m a list maker. I’m constantly scribbling down lists of things I want to do, places I want to visit, foods I want to try. And if there’s a pair of list makers in your life, a bucket list book is a thoughtful, romantic, and useful gift. They can use it throughout their life to write down vacation ideas, baby names, a wish list for their home, as both a source of inspiration and a lovely keepsake of how far they’ve come. 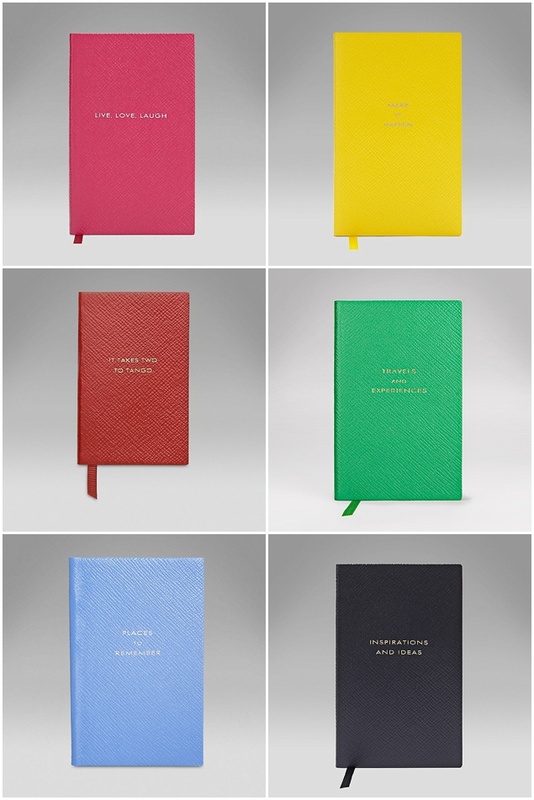 Choose a long-lasting quality notebook like Smythson or Moleskin so it goes the distance with them. The perfect gift for an adventurous or ambitious pair. 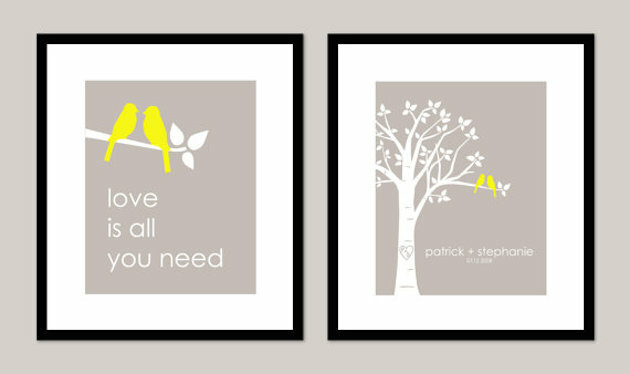 Everyone loves a personalised gift, and the special thing about a print is that firstly, it’s probably not the kind of thing a couple will buy for themselves, and secondly, it’s a versatile kind of gift that you can pair with your particular couple. Whether they’re music fans or sports fans, adventurers or foodies, sites like Etsy are filled with talented designer who can create something bespoke and beautiful, to hang in your couple’s home. Another gift that keeps on giving, a camera is such a fun and practical wedding present, giving the couple an opportunity to document their life as newlyweds. 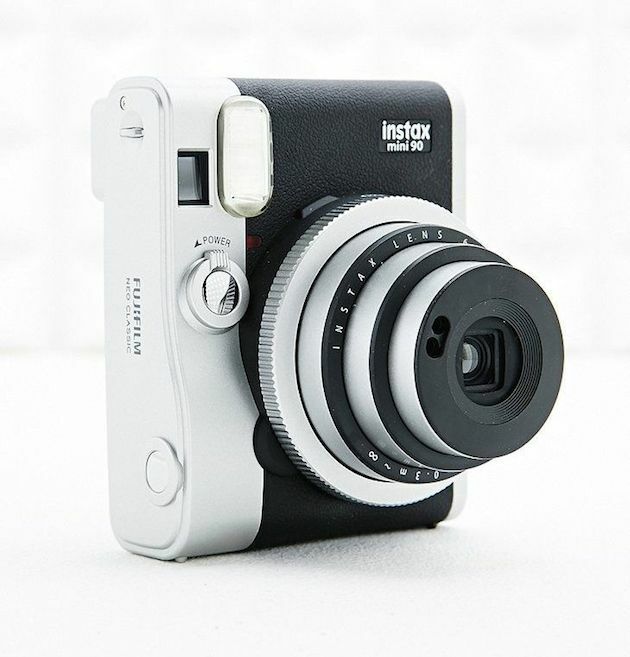 For something a bit special that the couple might not be likely to treat themselves to, why not opt for a Polaroid or Lomography camera, so your pals can take unique old timey pics on their honeymoon? The best thing you can possible gift your friends with is great times and wonderful memories. So how do you wrap that up and put a bow on it? Put money towards an experience for them. 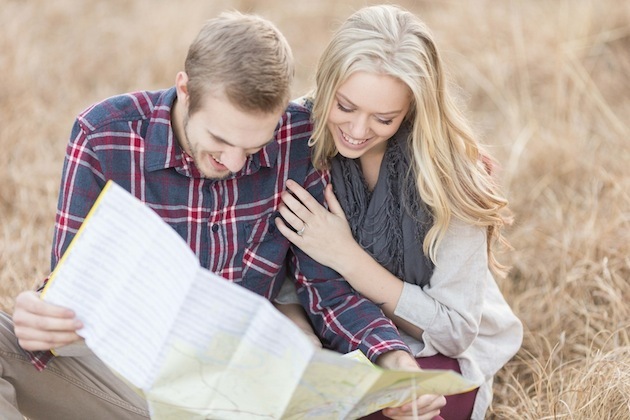 From cooking classes to surf lessons, portrait paintings to romantic dinners, look to sites like Better Ever After for ideas on what other couples add to their “experience registry”. Are you married? What’s the best gift you received for your wedding? 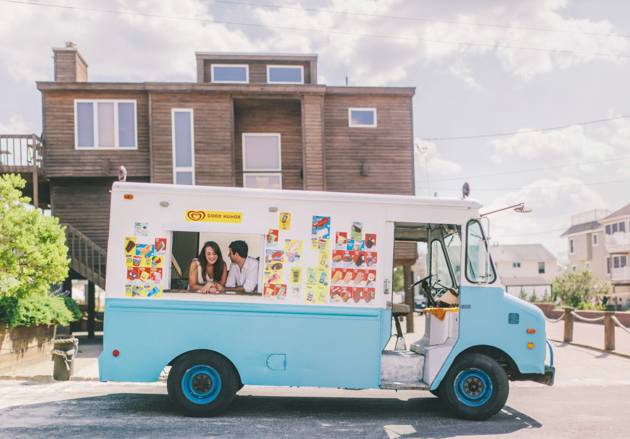 And if you’re headed to a wedding this summer, let us know what you plan to give the happy couple. For more wedding gift ideas, check out our ever-growing gift edit on Etsy. 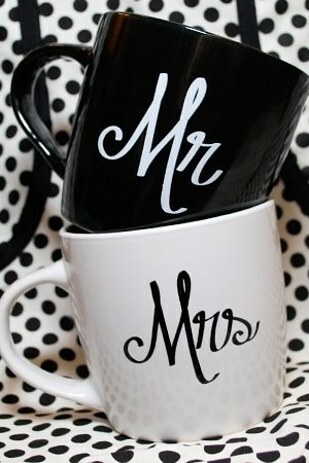 A wedding gift is an opportunity to congratulate the newlywed couple as they officially begin their new life together. While gift registries provide guests with an idea of what the couple needs to build a home — a Kitchenaid mixer, Egyptian cotton sheets — it is often the off-the-registry gifts that end up meaning the most. On Friday, we asked our followers on Twitter and Facebook to share with us the most thoughtful wedding present they’ve ever given or received. Click through the slideshow below for eight heartfelt gifts that left a lasting impression on the couple. Once you’ve sorted your outfit (course), it’s time to start thinking about wedding gifts. 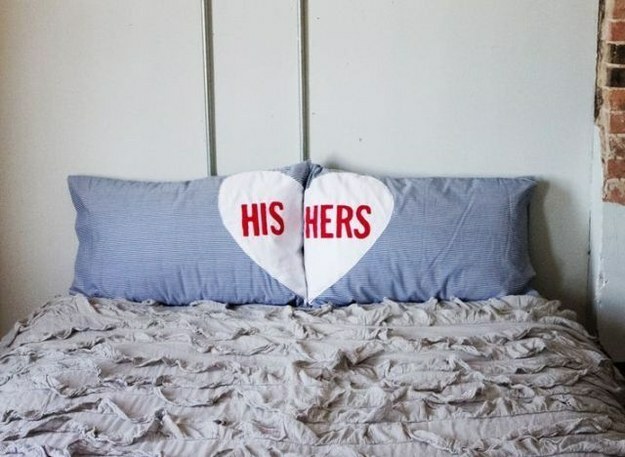 If you’re looking for wedding gift ideas for the happy couple, or you’re the couple themselves and are thinking about putting a registry together from hardtofind (excellent thinking), you’ll find all sorts of original and personalised finds to make what’s under the bow more meaningful. When it comes to wedding present ideas that go beyond the standard department store offerings, consider us your best-gift-ever go-to. What’s a good wedding gift for an Indian couple? 3. Cash Cards: Lot of Banks now provide cash cards, which can be given to the couple. Considering expenditures people incur on planning and organizing their wedding, a cash gift would be a welcome gift. Most banks provide this facility. Ideally, in today’s day and age, at least in India, the best gift to give would be to set-up a gift registry for the couple and encourage the couple to use that in order to help the couple start their new life with all that they might require. This is still not an accepted practice here, but trust me, makes gifting really systematic and proves to be extremely useful. and they use it everyday so that they can remember you for years . If you personally know the couple and close to them then i would suggest, ask them what they need as in India, newly weds get so many multiple gifts & gifts which they will never use and might give to someone else .. So knowing their requirement is a good start. If you don’t know them close enough, then you can go for blankets, bath robs, decorative items, watches etc. One of the nice way to show your love is to personalise the gift items. 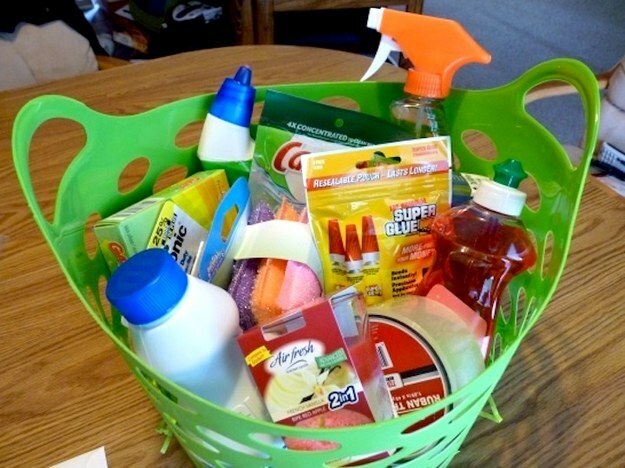 If you are close enough to the couple and are not really a fan of throwing a surprise, then the most practical way of going about this is to ask the couple for a list of things they are looking for while setting up their new home and pick an item from the list that fits your budget. Though this is popular as wedding registry abroad, the phenomenon has not really caught on in India. In case you don’t want to do that, the next option would be to buy something that you ‘know’ that they need – maybe a mixer-grinder or a sandwich maker. The only problem here is that there might be others who would have bought the same item as a gift. Easy option – cash. They anyway need it for their honeymoon, setting up a house, new life etc. So why not gift them cash – it is anyway an age old tradition and is also the most popular gifting option during weddings. If cash seems old-fashioned, then give them the new-age equivalent – shopping vouchers from popular e-commerce portals which can be exchanged for items of use. Tech gadgets are also a good idea, if the couple is interested in gadgets – fitness trackers, sound docks, headphones and external hard disks which are versatile gifts that are also useful. haven’t been to a wedding in over five years. This year? I’ve been invited to FOUR! I can only attend two because of my schedule, but I want to at least try to send a gift to the couples whose ceremonies I will miss. It’s easy for me to write a check; I know that’s what I wanted when I got married. When a couple has lived together and/or has amassed full homes-worth of items, it seems like money is the best gift to help them get started with their new life as a united, legal entity. However, some people find giving money a bit too impersonal or expensive– single people should expect to give between $100-150 each and couples $250-$300 each. Don’t worry! There’s nothing wrong with giving an actual wedding gift and most couples still create registries. Be sure to check out their wedding website or blog, or the invitation for more details. Image: Warren Rohner via FlickrWhat if buying another boring blender isn’t exactly your favorite way of saying, “Have a wonderful life!”? And what’s one to do when attending weddings is rare and money isn’t exactly falling from a tree? Check out what the BlogHer community has to say, of course! Modern Pilgrim has ideas for couple creating their registries and you can borrow from this list, too. My favorite is the wine cooler, but let’s not tell anyone that, mmkay? Sand & Sisal introduces us to a woman-owned company that created a fun way for couples to keep the fires burning in their new union: The Game of Love. Happy. Pretty. Sweet. has people like me in mind: The Last-Minute Shopper. 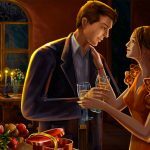 Check out their recommendations for some great wedding gifts to grab before showing up for the reception’s happy hour. 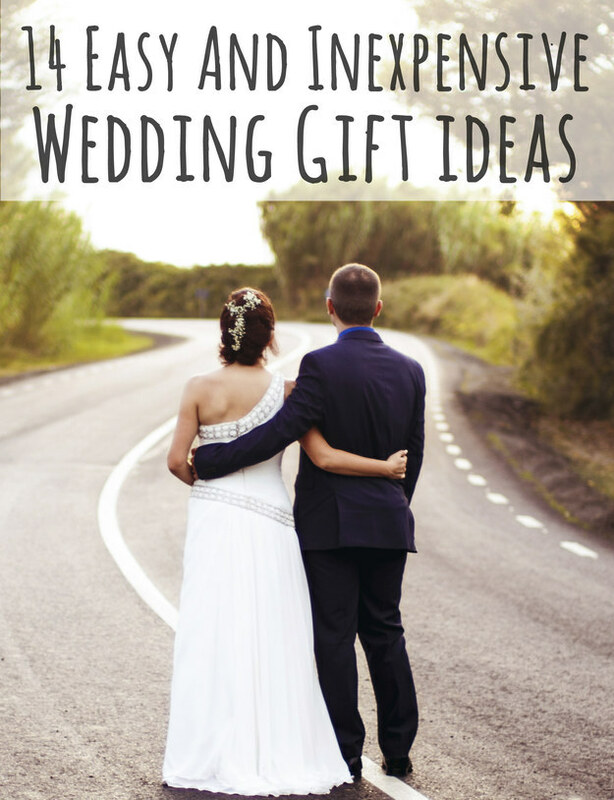 For the creative types, Home Made Modern has some great ideas for DIY wedding gifts that don’t require a lot of money or effort. It may even feel more personal to create a gift from scratch! 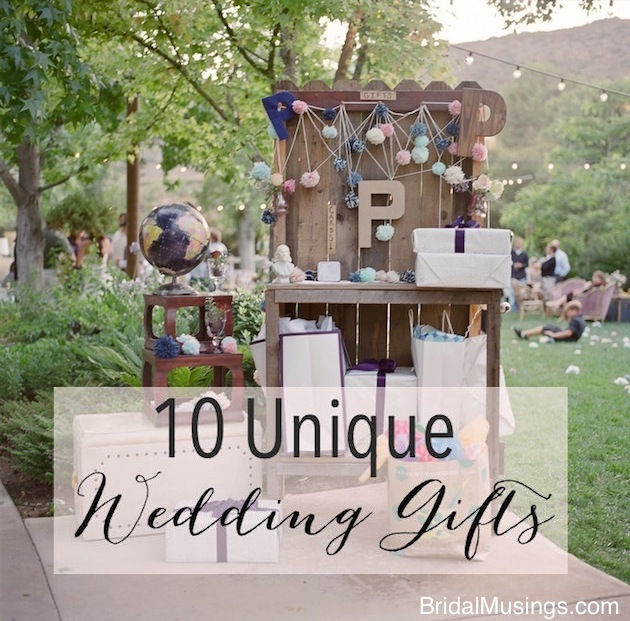 Don’t stress out over getting the perfect wedding gift. Most couples are just happy that you can attend and share in their joyous day. Don’t feel bad if you can’t spend as much because, as cliche as it sounds, the thought really is what counts most. 1. Pack up the ingredients for a romantic, homemade dinner for two. 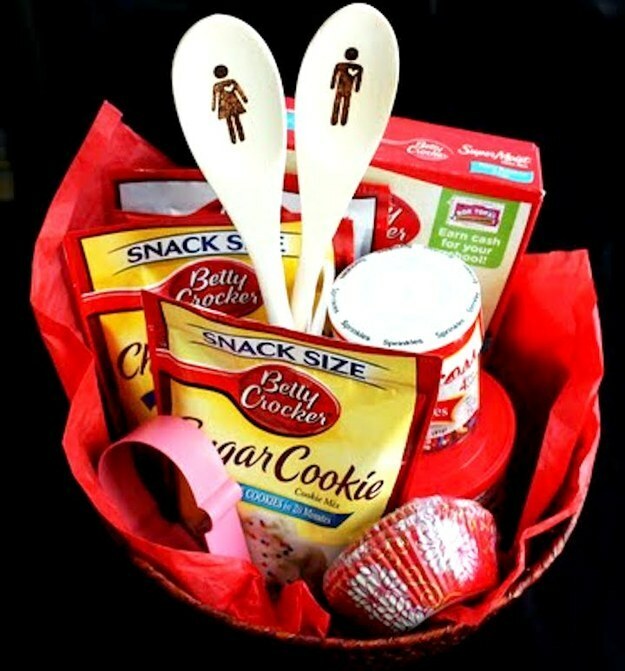 Wrap them in a colander to kick off the couple’s new kitchen supply. (And don’t forget a wallet-friendly bottle of red.) Here’s how to put one together. 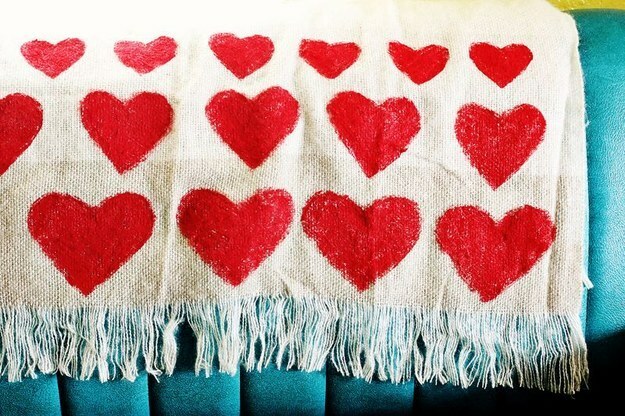 Set it against a swatch of colored fabric or burlap to tie into their color scheme. 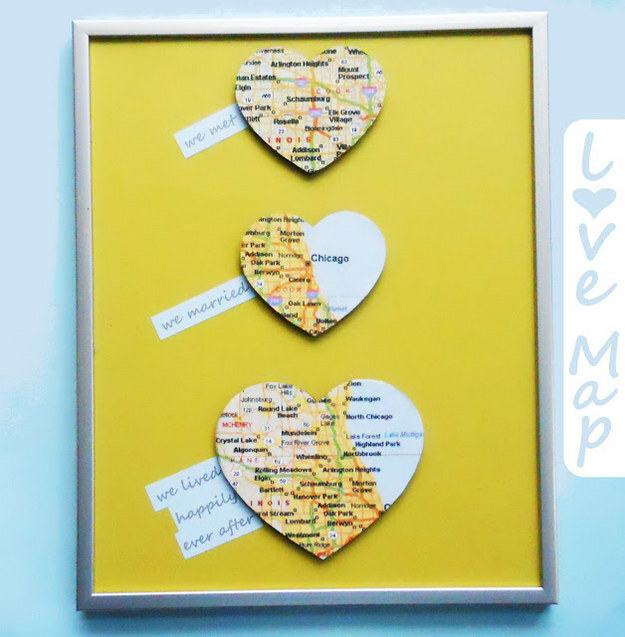 Print out copies of Google Maps or tear pages from an old atlas, and adhere them to heart-shaped wooden decals. These are less than $5 on Amazon.) Then frame everything for a wall-worthy piece of art. A small but incredibly useful gift: books of stamps. Sending thank-yous can be a mammoth task for any newly-married couple, but taking care of their postage ahead of time will give them one less thing to worry about. 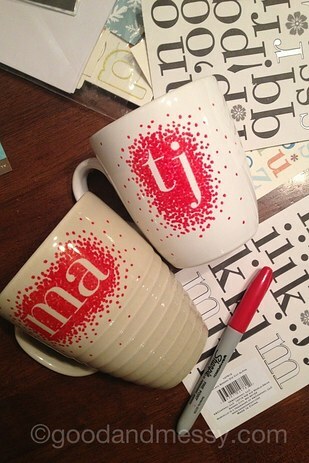 Plain mugs are super inexpensive at craft stores — and all you need to decorate them are Sharpies or enamel-based paint. To set the color, bake them in the oven for 30 minutes at 350 degrees. 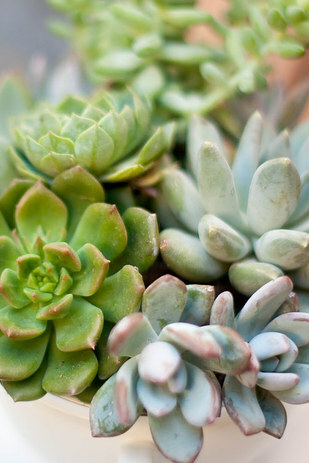 Like a houseplant, or — even less maintenance — these adorable succulents planted in teacups. Get the instructions. It can be as inexpensive as some quick snacks and frozen dinners from the grocery store, or as elaborate as a week of homemade meals. 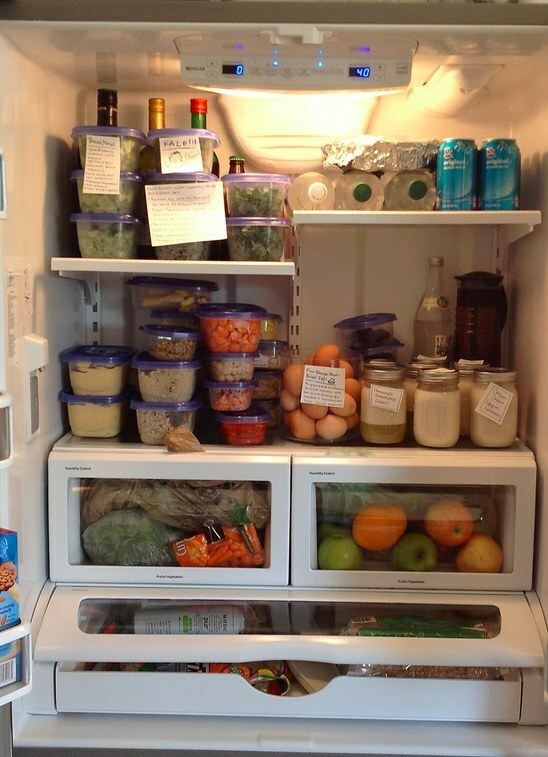 Point is: they’re not coming home to the dreaded empty fridge. Cookie dough and cake mix: both essential. Here’s how to put them together. Granted, it’s not most glamorous gift, but it’s one that will almost certainly be used and appreciated — especially if the couple is moving into their first place. 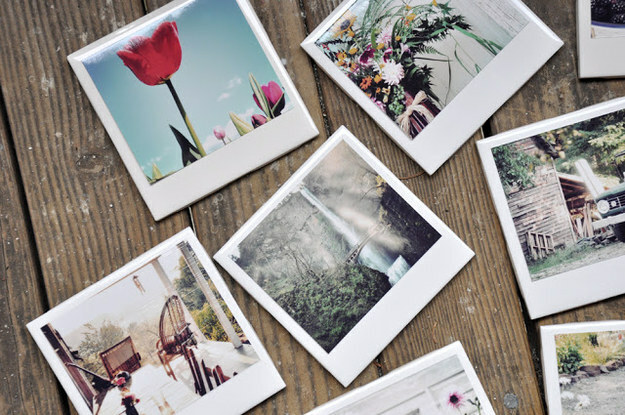 Print out some favorite photos of the couple, and adhere them to white ceramic tiles using a trusty bottle of Mod Podge. Set it with some acrylic spray, and you’ve got a set of personalized, Polaroid-inspired coasters. Get the instructions. If money’s really tight, consider offering your services. Whether it’s putting your photography skills to work at the ceremony, taking the lead on a post-reception carpool, or offering to dog-sit while the couple is away on their honeymoon. You’ll need some sewing skills for this one. 14. Wrap them up in love.